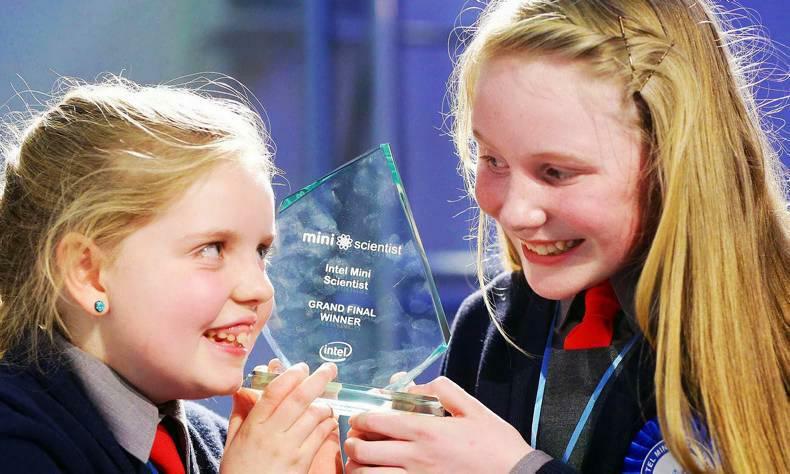 Timahoe NS are no strangers to science awards, but last weekend’s crowning as All Ireland Intel Mini Scientists for the second consecutive year brought things to an entirely different level. Sixth-class students Sinead Buggy and Laura Miller from Timahoe NS scooped the top prize for their project Leaping Labradors. Sixth-class students Sinead Buggy and Laura Miller from Timahoe NS scooped the top prize for their project Leaping Labradors, a video game for the visually impaired. The game will now be available to download for free from the National Council For The Blind Ireland’s website (www.ncbi.ie). The girls wondered what sighted young people could do that visually impaired young people could not, and that’s where they got the idea. They surveyed their classmates to ascertain what their top pastimes were, and from a list of four – reading, playing sport, watching TV and playing video games – they decided to try to do something about the latter. Noreen gave the girls great feedback and suggestions for improvement. With those changes made, the girls travelled to St Joseph’s School for children with visual impairments in Dublin to trial the game again. Last year’s winning project, Murderous Mascara by Roisin Dunne and Jamie Boyle, also from Timahoe NS, investigated levels of bacteria lurking in mascara tubes. Minister for Skills, Research and Innovation Damien English presented the award to the girls last weekend. The school will also receive a grant of €1,000 from Intel.